Hi everyone! Happy June! And wow....Happy KOTM!!! What a fun Creative Cafe' kit this month! 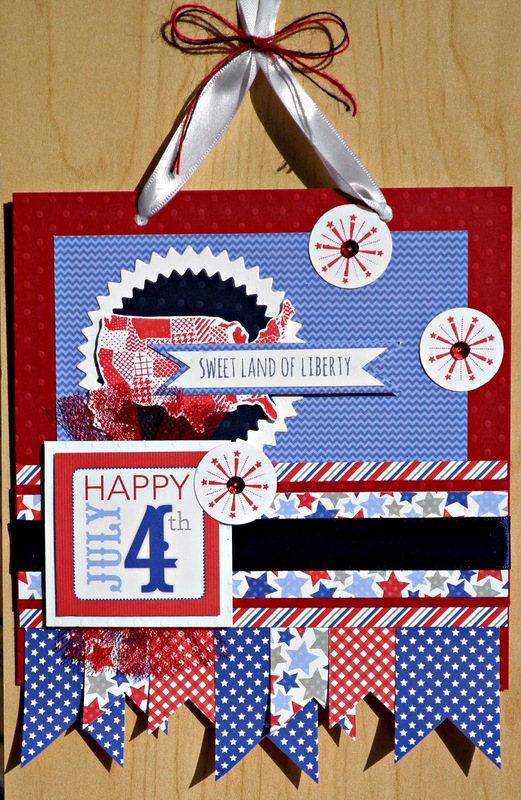 I'm a huge fan of making my own home decor for holiday, so instead of another card, I created this sweet little wall hanging for the 4th of July! 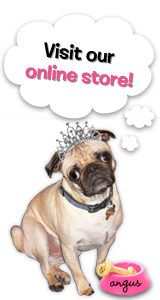 You can create one of these too! Grab your kit and let's get started! Base: Start with a 6x6 piece of cardboard. I save cardboard from paper packs I buy, but any will do! Cut a 6x6 piece of red swiss dot cardstock and glue to cardboard using Scrap Happy Glue. First Layer: Cut a 5"x5" piece of blue chevron pattern paper and glue to the center of the red cardstock piece. Next create the banners border. Cut banners in various sizes for the bottom edge....I cut the stars and red weave print papers at 1" wide, and the blue star paper at 1&amp;1/4" wide. Line them up along the bottom edge of the 6x6 base piece and when you like the arrangement, take a piece of Scor-Tape and stick it down along the top edge of the banners. Turn over and do the same along the back side. Don't glue this down yet. 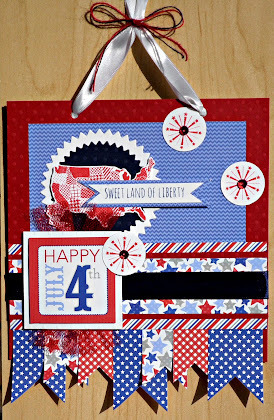 Create the center strip using a 6" by 2" piece of stripe pattern paper layered with a 6" x 1&amp;1/4" piece of star pattern paper that is matted on a 1&amp;1/2" piece of red swiss dot cardstock. Wrap a piece of the blue ribbon around the center and glue. Take this piece and banner piece created above, glue together and then attach to the base piece. To create the other piece....cut a white and blue circle from swiss dot and glue together (circle size is 2&amp;3/4" and 2&amp;1/4"). 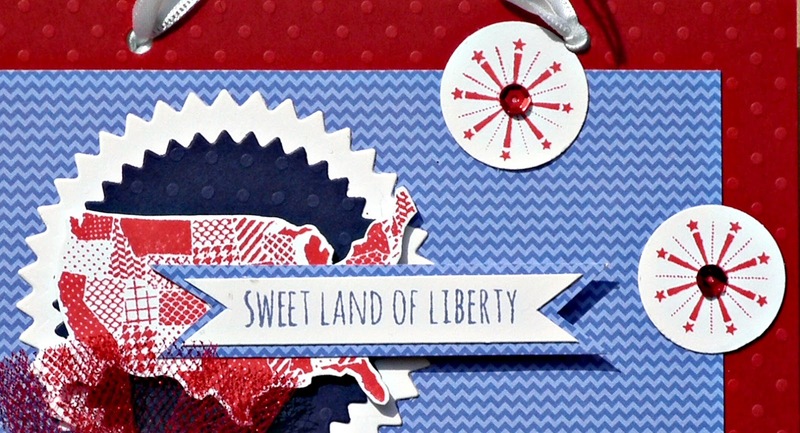 Stamp map using Festive Berries Distress Ink, fussy cut out and foam tape to the circles. Stamp sentiment on white cardstock using Faded Jeans Distress Ink, and cut into banner shape, mat on blue chevron paper, and add to map. 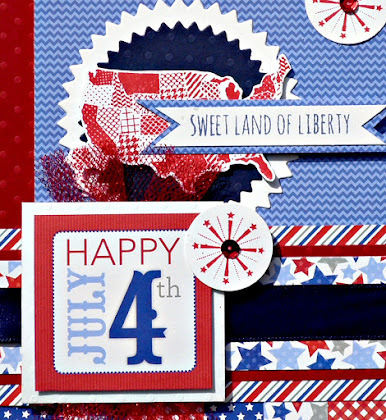 Stamp the fireworks with Festive Berries Ink and punch out with a circle punch ( I used a 1" punch). Add a sequin to the center using Scrap happy Glue, then glue down to the project where desired. To complete, just punch a couple of holes in the top, and add a ribbon of your choice (a lot to choose from in the kit!). Then hang up your festive work of art! Thanks for stoppin' by today! Stop back soon....so much inspiration waiting for you this month!